Watching Rosencrantz and Guildenstern are Dead you can’t help marvelling yet again that Tom Stoppard was still in his 20s when he wrote it. The absurdist play, which made his name when it premiered at the 1966 Edinburgh Fringe, is not only an existential riff on Shakespeare’s Hamlet but also draws on Beckett’s Waiting for Godot. As we’ve come to expect from Stoppard, it is full of dazzling verbal and intellectual gymnastics, as well as meta-theatrical musings. When Rosencrantz and Guildenstern watch their death predicted by the players it becomes a play within a play within a play within a play. I think. With all the double entendres, puns, witticisms, word games and allusions it is a dense, cerebral piece and pays to listen closely. And yet, when it’s performed well – as it is here – it is as funny and poignant as it is clever. In this smashing Sydney Theatre Company production, directed by Simon Phillips, Tim Minchin and Toby Schmitz play the hapless Rosencrantz and Guildenstern – two minor characters from Shakespeare’s Hamlet who find themselves centrestage trapped in a world they don’t understand, with no knowledge about where they came from or what they are there to do beyond what they’re told. 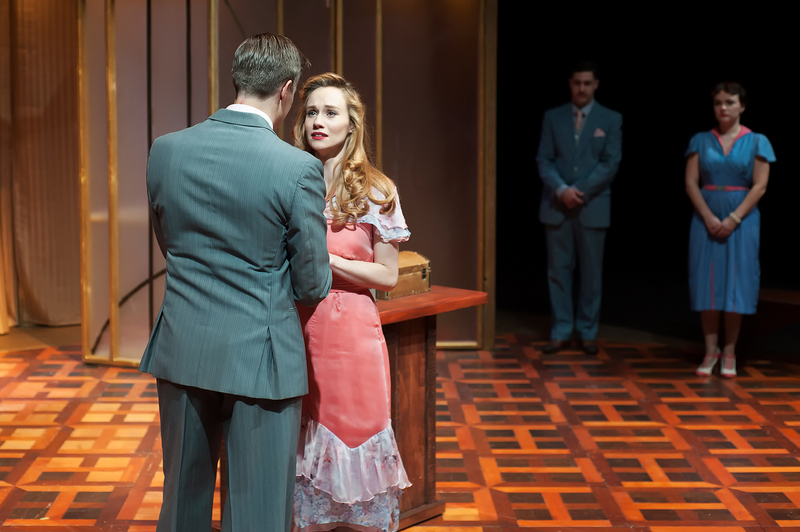 As they wait – like Godot’s Vladimir and Estragon – for something to happen, the rest of Shakespeare’s play unfolds in the wings, spilling occasionally onto stage around them as events beyond their control hurtle them towards their death. Minchin and Schmitz make a charismatic double act. As the more authoritative, philosophical Guildenstern, who has a keener awareness of their existential plight, Schmitz has the lion’s share of the words and delivers them superbly with an increasingly desperate bravado. I’ve rarely seen him in better form. He really does disappear into the character – and not just because his trademark floppy hair is hidden by a curly wig. 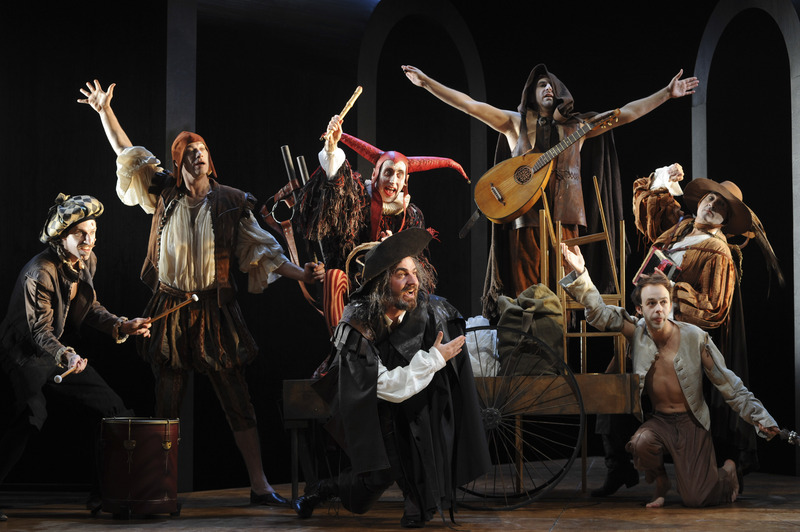 Minchin’s Rosencrantz is more of an innocent: a gentle, naive, clown-like soul. Cheerfully oblivious at first to their plight, he gradually becomes increasingly exasperated and then anxious. Together they mine the comedy brilliantly but are also touchingly tragic figures as they face their fate. They are surrounded by an exceptionally fine cast. Ewen Leslie is in swashbuckling form as The Player – the actor-manger of a rag-tag company who still loves a grand, theatrical flourish but is well aware that life is a charade. As the players, George Kemp, Angus King, Nicholas Papademetriou, Berynn Schwerdt, Aaron Tsindos and Paul Cutlan create a wonderfully eccentric, tatty and downtrodden group. Kemp, in particular, as young Alfred, who has to play all the female roles, does a lovely, very funny job of capturing their abject situation. 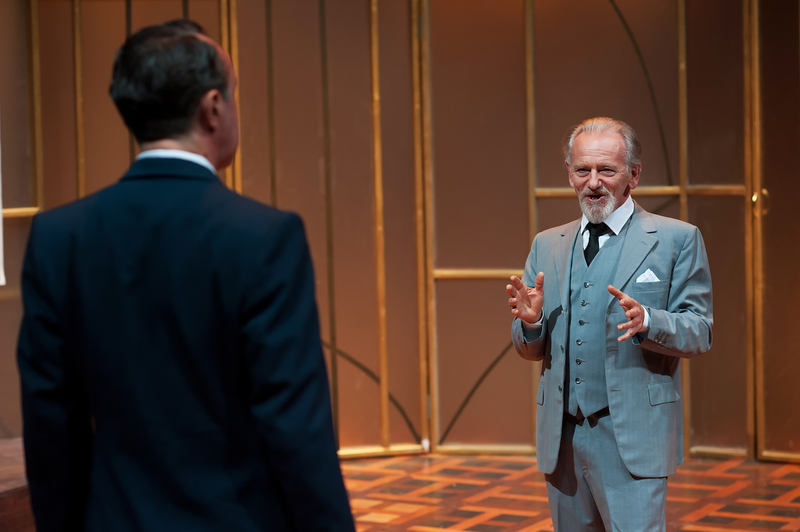 The fact that actors of the calibre of John Gaden, Heather Mitchell and Christopher Stollery were happy to play the small supporting roles of Polonius, Gertrude and Claudius says a great deal about the esteem in which they hold Minchin, Schmitz and Phillips – and the play itself. Together with Adele Querol and Tim Walter as Hamlet, they play the court scenes from Hamlet with an outlandish theatricality, creating hilarious caricatures that emphasise the strangeness of the world in which Rosencrantz and Guildenstern find themselves. Gabriela Tylesova’s design is a triumph. A steeply raked stage is flanked by sharply converging black walls that lead to a vanishing point in the void, while three arched tunnels down each side play tricks with perception under Nick Schlieper’s lighting. Hanging overhead is a weird funnel spouting a dead tree (a nod to Godot) that becomes a candelabra. Into this mysterious, foreboding space, Tylesova introduces sudden explosions of colour with her whacky Elizabethan costumes for Hamlet’s court. Phillips collaborated with Tylesova on the dazzlingly staged Australian production of Love Never Dies – and this production confirms that theirs is a very fruitful creative partnership. 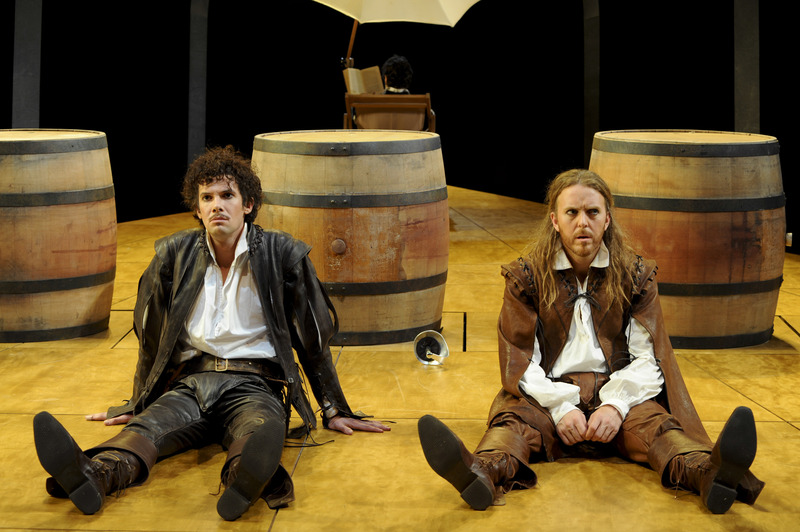 All in all this Rosencrantz and Guildenstern is a stunning production, which, not surprisingly, is all but sold out. However, you can still try for one of STC’s Suncorp $20 tickets – on sale at 9am each Tuesday morning for the following week, either in person at the box office or on 9250 1929.